It may have begun life as a Feast Day in honour of the venerated St Patrick but the 17th March is now a more general celebration of all things Irish. With the Irish community’s strong ties to the northeast United States, and similarly spirited celebrations popping up right across the country, we’ve picked the places where you can count on being wowed by dazzling St Patrick’s Day parades and some equally memorable parties. So don your best shamrock hat, crank up the Celtic tunes and enjoy this guide to the top stateside Paddy’s Day parades. Boston is one of the States’ flagship Irish towns with the annual festivities focusing on the South Boston neighbourhood. Join the crowds for the annual South Boston Parade, which makes its way around town from West Broadway, finishing in Andrew Square. Count on bagpipers, marching bands and elaborate floats dedicated to iconic Irish and Bostonian figures from times past. When the parade’s over, grab a bite at one of South Boston’s best Irish-flavoured eateries – just be sure to arrive early to grab a good spot. Getting There: Fly with Delta, non-stop from London to Boston, £397 return per person www.delta.com. Hertz car rental from £173 for one week for an economy group car. Visit www.hertz.co.uk for more information and to book. Hertz Top Pit-Stop:www.oasisguesthouse.com from £80 per person per night. Oasis Guest House and Adams Bed and Breakfast are neighbouring brownstones in the historic Back Bay area, close to the city centre and easily reached from the parade route. There’s a surprisingly large Irish contingent all the way out in Butte, Montana, which also celebrates An Rí Rá Festival each August. But the 30,000 people who descend on town each March – doubling Butte’s population in the process – are greeted with an equally engaging celebration of the Motherland. The parade begins uptown, where the procession marches past town landmarks before returning to its starting point on Mercury and Montana. Call in at one of the town’s pubs and restaurants for a helping of Irish-American favourite corned beef and cabbage. Getting There: Fly with Delta via Amsterdam and Salt Lake City for £497 return per person www.delta.com. Hertz car rental from £385 for five days for an economy group car. Visit www.hertz.co.uk for more information and to book. Hertz Top Pit-Stop:www.copperkingmansion.com from £84 per night. 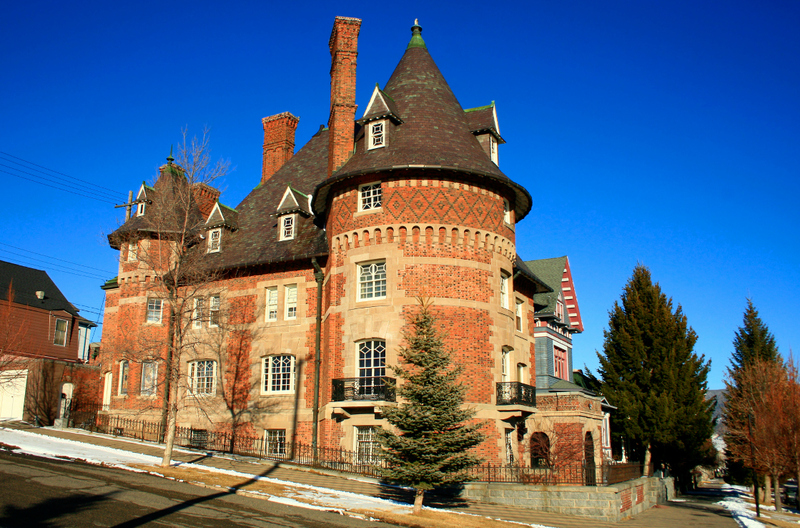 The Copper King Mansion was built for the Clark Family, one of Montana’s original Copper Kings, during the 1880s. A charming slice of Victoriana, this bed and breakfast is a stone’s throw from the parade route, and offers a free guided tour to overnight guests. As the annual tradition approaches its 250th year, Philadelphia has become one of the country’s largest parades with all-day TV coverage and a host of star names. Each year the parade takes the theme of a prayer to the patron saint to give thanks and ask for protection. In 2017 it’s ‘Protect and Guide Our Police Officers’, which means you can expect dedicated floats and events based around the boys in blue. The march goes from City Hall, down Market Street past a performance area, before ending at Penns Landing and the site of the Irish Memorial. Getting There: Fly with British Airways from London Gatwick to Philadelphia International Airport from £362 return per person www.britishairways.com. Hertz car rental from £172 for one week in an economy group car. Visit www.hertz.co.uk for more information and to book. Hertz Top Pit Stop: www.thewindsorsuites.com from £70 per person per night. With its own Irish pub on the premises – Con Murphy’s – where better to spend St Patrick’s Day than The Windsor Suites, a well-appointed hotel within walking distance of some of Philadelphia’s finest landmarks. If a day-long traditional celebration of all things Emerald Isle feels like too much, why not head down to Arkansas’ scenic highlight for a much briefer affair – one stretching for just 98 feet down Hot Springs’ Bridge Street. The 14th annual World’s Shortest St Patrick’s Day Parade is made up of just 40 floats but more than makes up for it with some serious star power. This year’s Celebrity Grand Marshal is Alfonso Ribeiro – best known as Carlton from The Fresh Prince of Bel-Air – while the Official Parade Starter will be 16-time world champion of wrestling Ric Flair. Getting There: Fly with British Airways from London Gatwick to Little Rock with stops in Madrid and Dallas Fort Worth from £521 per person www.britishairways.com. Hertz car rental from £279 for one week in an economy group car. Visit www.hertz.co.uk for more information and to book. Hertz Top Pit Stop: www.lookoutpointinn.com from £122 per person per night. Nestled in the Ouachita Mountains, this quaint lakefront B&B offers a luxury getaway complete with the promise of dips in the beautiful Lake Hamilton it overlooks. 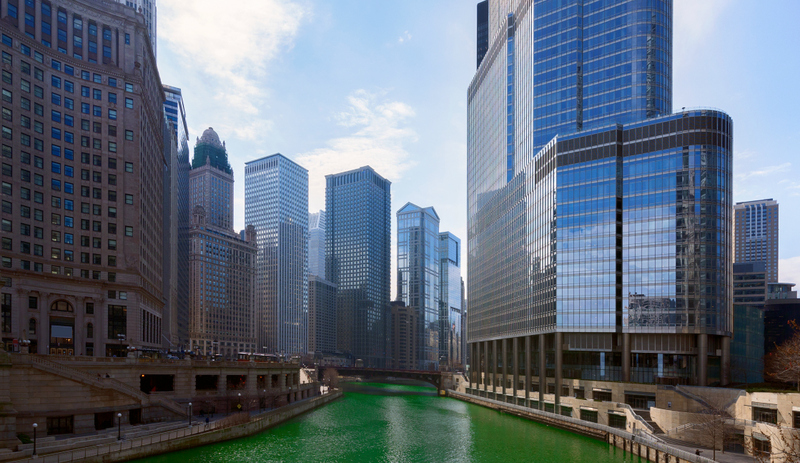 Last but not least, possibly the grandest statement of them all comes in the Windy City, where – along with the towering skyscrapers – the Chicago River turns a serious shade of green every year in honour of St Patrick’s Day. The eco-friendly dye used to colour the waters is one of the industry’s best-kept secrets, not to mention an integral part of the celebrations. The Parade will begin on Columbus Drive at noon on March 11, proceeding north through Grant Park and ending at Monroe Drive. The parade lasts three hours, rain or shine, and features eye-catching floats and performances from Chicago’s strong Irish contingent. Getting There: Fly with Austrian Airlines from London Stansted to O’Hare International Airport with a stop in Vienna for £437 per person www.austrian.com. Hertz car rental from £194 for one week in an economy group car. Visit www.hertz.co.uk for more information and to book. Hertz Top Pit Stop: www.acmehotelcompany.com from £114 per person per night. This cool boutique hotel is located in the trendy River North right next to the city’s Magnificent Mile and its dazzling array of shops and restaurants.